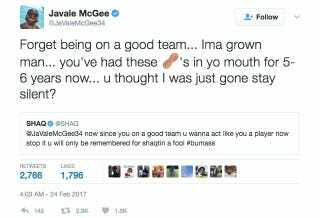 Human lowlight reel JaVale McGee and Shaq have had beef for a while now. Shaq loves to make fun of the silly stuff McGee (who, it should also be said, is having a really good season with the Warriors) regularly does on the court. McGee, in contrast, hates it. Last night, the beef reached all new, multi-media heights. It all started, as it usually does, on Inside The NBA. There, the McGee talk actually started with Shaq appearing to bury the hatchet. Shaq recounted something he heard Draymond Green say, that Green loves the show’s “Shaqtin’ A Fool” segment, but that he feels that his teammate McGee turns up on it too much. In response, Shaq promised Green that he’d refrain from putting McGee on last night’s “Shaqtin’ A Fool,” and sent McGee a challenge: If the big man didn’t mess up in a game for the next two weeks, Shaq wouldn’t put McGee on there for the rest of the season. Then, Shaq revealed this, a McGee-as-Doctor-Strange parody video which I don’t really understand at all but is nonetheless hilarious to me. McGee deserves credit for great use of the peanut emoji, though we still have to declare Shaq the victor. This beef is the best.